I'm not sure this is the right forum or if it's directly related to MX, but this is a bit of a problem for me, and I am having difficulties finding a solution. Is there a way to rectify this? And if so, can it be explained in a way that a dumb beginner like me can understand? I already tried the about:confit method, but couldn’t find any “ui-allow” line people specify. I keep getting directed to gtk3-filechooser patches, but have no idea what to do with them, or even if I'm downloading the right thing. Last edited by dfp5 on Tue Nov 06, 2018 8:29 am, edited 1 time in total. Good post: I have the same situation, but never stopped to do anything about it. I am using Opera, so different browser and different engine. Try this: open Thunar > Preferences > Display and change the Show thumbnails pull-down menu to "Always." Then log out and back in. Seems pretty typical. Same happens with Google Chrome and dolphin. It never bothered me and I never even thought about. I think PC Fileman has a - thumbnail view. Not sure if that is what you are looking for? That's a very long outstanding issue to show thumnails of all files like with a full file-browser - never solved by the Gnome folkes, who are providing gtk-file chooser. 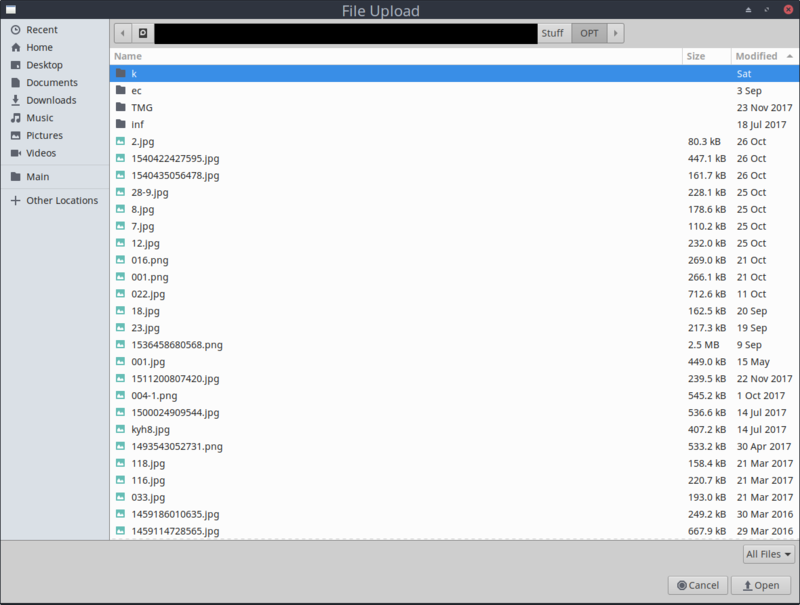 But what you have is a preview/thumbnail on the right side of a selected file within filepicker ( gtk-filepicker ). That shows them, but they're microscopic sized. I'm looking for something that resembles the Windows image I posted. It doesn't matter what File Browser I use, Firefox will always have that list thing and tiny images. Yeah, I know. I didn't get that in the screencap initially, but I still don't like it. I tend to upload images quite frequently in my internet browsing, and I have a very large image folder. With the way it works here on MX (and other GNU/Linux distros), the process of finding the image I want takes a lot longer than it would be on Windows 10, which is almost a game-breaker for me. But have no idea how to, and there don't seem to be simple instructions. Is there a guide on how to use it?